This exquisite Emerald-Cut Pink Topaz Solitaire Ring is the perfect piece to add a splash of pink to your jewelry collection. Like a burst of color on a summer day, this exquisite solitaire radiates with stylish crimson hues that are sure to keeping you smiling all day and to brighten up any evening affair. This ring features an emerald-cut pink topaz stone (6mm by 8mm), positioned vertically on the ring in a solid gold setting above the band. Light emanates from the rectangular stone, not only on the top but also along all four sides, creating a bloom of pink with a slight hint of purple. The stone sits on a 14k white gold band measuring 4mm wide and finished to a satiny smooth surface. 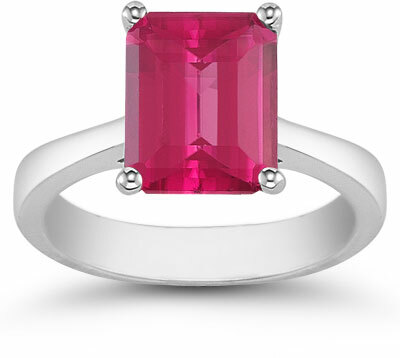 This pink topaz solitaire ring is a wonderful way to add some fresh color to your wardrobe, plus the surface treatment of the white gold adds a contemporary feel to the piece. This ring is the perfect accessory for a garden party or a night out in an evening dress. We guarantee our 8mm x 6mm Emerald Cut Pink Topaz Solitaire Ring, 14K White Gold to be high quality, authentic jewelry, as described above.